THE CHRONICLED HISTORY OF THE BUILDING. Proportions and general description YORK cathedral is in plan and proportion the simplest imaginable. It is in the form of a cross, of which, in rough measurement, the eastern limb is of the same length as the western, the total length of the transepts equal to half the total length of the nave and choir, and the width of the nave outside the wars equal to half the total length of the transepts; or, in other words, the transepts are in length twice the width of the nave, and the whole church is four times the width of the nave. The choir is somewhat narrower than the nave, and the transepts still narrower. The church is square at the east end as well as the west, and the transepts have aisles to the west as well as to the east. The simplicity of its form is very little disturbed by external chapels and buildings, with the exception of the chapter-house and of a few chapels on the south side of the choir, to which formerly corresponded similar chapels on the north. A lofty tower rises in the middle. Two towers flank its western front, and in the middle of each side of the eastern limb of the cross one compartment of the side aisle is carried up to the roof, so as to form a kind of eastern transept. As the choir is somewhat longer than the nave, and its pier arches narrower, nine compose the length of the choir and eight that of the nave. aThe church is an aggregate of various styles, having Early English transepts, a Decorated nave, of which the body has geometrical tracery, and the west end flowing, tracery. The choir is in two portions, of which the most easterly (more correctly termed the presbyters is of very early Perpendicular, and the western (or choir proper) of later Perpendicular. The central tower and the western towers are also Perpendicular, and subsequent to the choir. In the crypt are remains of earlier buildings. This is the general arrangement of the church, whose architectural history I propose to investigate and compare with the structure as it now exists. And first, with respect to the period before the Norman Conquest, I shall give those passages of the historians, that relate to the church as nearly in their own language as possible. After the battle of Heathfield, where Edwin was killed (AD 633,) "His head was brought to York and subsequently placed in the church of St. Peter, which he began but his successor Oswald finished, as above stated, and it was deposited in the porticus or chapel of St. Gregory the pope, from whose disciples he had received the Wordc." Wilfrid's restoration (AD 669) Archbishop Wilfrid, (AD 669) as we are told by his biographer Eddius Stephanus, and by William of Malmsbury, found this building and its office in very bad repair, (only about forty yeas after its first foundation.) "The leaking roofs admitted rain, and the open windows birds, who built their nests within, and were constantly flying in and out. The rain and the birds together, defiled and discolored the neglected walls. But our holy bishop, in horror that the house of prayer should be thus brought to resemble a den of thieves, straightway undertook to repair it. He restored the rotten ridges of the roof and covered it with pure lead. ... The windows, which formerly derived their light from the transparency of linen, or of boards pierced with many holes, he provided with glass, thus excluding the birds and rain, yet admitting the light. He cleansed the walls and made them whiter than snow with white lime, and not only furnished the house and altar with ornaments and vessels, but endowed it with many landsd." It is a misfortune in these early histories, that we are often obliged to derive the successive notices of a building from various and independent authorities; and thus it happens with the two next particulars usually quoted by modern compilers as belonging to the history of York cathedral. In the first place, a fire is thus concisely recorded by Hovedene; "In the year 741, a monastery in the city of York was burnt, ; on the first day of the week and the ninth calend of May;" that is to say, the 23 rd of April. But whether this " monasterium" is to be interpreted of the church in question, or how far it might have suffered, must remain doubtful, and fortunately is of no great consequence. The second particular is the erection of a new church, which is mentioned in a poem by Flaccus Alcuinus, on the bishops and saints of the church of Yorkf;. This versified biography, after bringing down the history of the prelates of York to Albert, (who succeeded in 966,) concludes a lengthened panegyric upon this latter bishop, by saying that he also added many ornaments to the churches. Albert adds ornaments to church and builds new church " For as the warlike king Edwin had received the water of baptism, the bishop had constructed a large altar and covered it all about with gold and silver and jewels. He dedicated it to the name of holy Paul; He suspended above this altar a lofty candelabrum, which sustained three large vessels for oil with nine rows of lights.g; He raised the banner of the cross aloft the altar, and covered the whole with precious metals.... And he made another altar, and clothed it with pure silver and with precious stones, and dedicated it to the martyrs and to the cross. He commanded the great Ampulla from which the priest during celebration was to pour the wine into the chalice, to be made of refined gold of no small weight. But a new structure of a wondrous basilica was in the days of this bishop began, completed, and consecrated. This house of appropriate altitude is supported by solid columns set under curved arches. Within it sparkles with admirable ceilings and windows, and in its beauty shines, environed with many aisles (or apsidal chapels). It has a great number of apartments with distinct roofs, which contain thirty altars with various ornaments. Two disciples, Eanbald and Alcuin, at the command of the prelate erected this temple, and he himself consecrated it to the I Alma Sophia' (the Saviour) ten days before his death." Was Albert's church the same as Paulinus'? Now, although it is plain from this history that a church was erected by this bishop, I think it may fairly be inferred that it was on a different site from the cathedral of Paulinus, repaired by Wilfrid. In the above inflated narrative the two altars appear to have been erected in the said cathedral, the first in honour of the baptism of Edwyn. But if the basilica bad been rebuilt on the same site by the bishop, its description would hardly have followed that of the altars, without at least some connecting link between them. -- Moreover no writers of the history of York, as Malmsbury or Stubbs, make any mention of this basilica of Albert; they give the original foundation, and the repair by Wilfrid; but they pass by the work of Albert in silence. I believe, therefore, that this description belongs to some other church, either erected in York or elsewhere in the diocese. Nevertheless it is a very curious and valuable description of a Saxon church. chronicle From the Norman Conquest to the fourteenth century our notices of the history of the building are almost entirely derived from the chronicle of Thomas Stubbsh, with the exception of documents and charters belonging to the chapter. As the passages in this chronicle are not numerous, it will be convenient to place them in order, apart from the other authorities, and I shall therefore, in the next place, give a narrative wholly made up of sentences translated literally or derived from Stubbs, and which will be found to include. I believe, all that he has recorded relating to the edifice. Stubbs on the Norman Conquest and the administration of Thomas , the first Norman archbishop " When Thomas the first Norman archbishop of York came to the see, (AD 1070,) the city of York and all the surrounding country had been nearly destroyed by fire and sword, at the command of William and his Normans." (This was done, as is well known, out of vengeance for their insurrections and resistance to his authority.) " The metropolis of the blessed Peter was fired, with the church and its ornaments; its charters and privileges were burnt and lost. The surrounding country was depopulated, and the soil from the Humber to the Tyne, deprived of the husbandman's care, remained for nine years a horrible wilderness." Out of seven canons (the proper number) he found only three; the others were either dead, or had been driven out of the country by fear or by its desolation. The church he roofed and restored as well as he could, replaced therein the canons whom he found, and recalled those who were dispersed, added some others, rebuilt the refectory and dormitory, appointed a prior, "praepositum"and in other respects began to set in order the affairs of the establishment. Afterwards he separated the prebends, the canons having, previously for many years lived in common; he appointed a dean, treasurer, precentor, and master of the school; he built the church which now exists from the foundations, and provided it with clergy, books, and ornaments. " And after holding the episcopate for thirty years, he died at Ripon, but was buried at York, in the church next to his predecessor Aldredi." Stubbs on the administration and works of archbishop Roger (1154-1181) Roger, chaplain of Henry II, and archdeacon of Canterbury, was appointed the thirty-first archbishop of the see in 1154, and held it until 1181k; This Roger constructed anew the, choir of the cathedral church of St. Peter at York, together with its crypts and the archiepiscopal palace in York, which is situated close to that church. He also built the chapel of the holy sepulchre at the gate of the said palace on the north side of the very church of St. Peter, and dedicated it in honour of Mary the another of God, and the holy angels. He endowed it with eleven churches, and instituted for its service thirteen ecclesiastics, namely, four priests, four deacons, four subdeacons, and a sacristl. And because the canons of the church of St. Peter complained that the said chapel was placed too close to the another church, he ordained that his sacrist should provide for the expenses of the ceremonies of Holy Thursday, By way of conciliation . . . . . And he was honourably buried in the middle of the choir of the blessed Peter, of the church of York, which he, had constructed anew. Stubbs on the administration of archbishop Walter Grey (1216-55) Walter Grey, the thirty-third archbishop, was translated from Worcester in 1216 and died in 1255. He ordained and founded three perpetual chantries at the altar of St. Michael within the church of York, where he lies buriedm. (1285-95) Johannes, surnamed Romanus the thirty-eighth archbishop, retained the see from 1285 to 1295. " 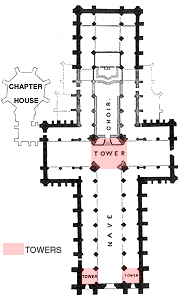 His father John, a Roman by birth, and by office treasurer and canon of the church of York, constructed, at His own expense, the north part, of the cross of the church of St. Peter, which extends towards the archbishop's palace, and also the noble campanile which is in the middle of the cross of the same church." . . . "And in the year 1291, on the 8th idus (the 6th of April, the foundation of the nave of the great church of St. Peter at York was begun on the south side towards the east, in the presence of John the archbishop, Henry de Newerk the dean, and Peter de Ros the precentor, as well as the other canons, of the church then in residence. And the archbishop devoutly laid the first stone on that day with his own handsn." Administrations of 14th century archbishops. William of Melton (the forty-second archbishop, 1315-1340) " repaired the tomb of St. William at the expense of twenty pounds, and completed the west part of the nave of the church of St. Peter at York by a gift of seven hundred pounds of silver, . . .. and he was buried in the church near the fonto. " William de la Souche (forty-third archbishop, 1340-1352) had began the work of a certain chapel adjoining to the south side of the church of St. Peter, in which he intended to have been buried, but dying before its completion, was buried in the aforesaid church before the altar of St. Edward, king and confessor; his sepulchre remained long covered with the stone pavement, in demonstration of the gratitude of his relatives and others, to whom during his life, he had been a noble benefactor. " John of Thuresbyp; (Forty-fourth archbishop, 1352-1373) "in the tenth year of his pontificate, iii. cal. Aug., (i.e. July 39,) began the fabric of a new choir to his church of Saint Peter, with the assent of his chapter. He bestowed upon the work one hundred marks of his own gift at the laying of the first stone, and afterwards for every year during his life he gave two hundred pounds to the said fabric. And to excite the devotion of the faithful towards the promotion of the work, he obtained liberal indulgences from the apostolical fathers .... The same archbishop, as a true lover of the Virgin, completed a chapel to her with wondrous sculpture and painting. And at his own expense he there caused to be entombed the bodies of many of his venerable predecessors in the pontificate, which were translated up from the choir. And he endowed there a chaplain to celebrate for the souls of himself and of all the faithful dead..... And he was buried before the altar of the Blessed Virgin in the new work of the choir, in the year of our Lord 1373."